The world is getting better at a stunning rate, and as we celebrate Thanksgiving here in the U.S., I wanted to offer you some convincing details and data. 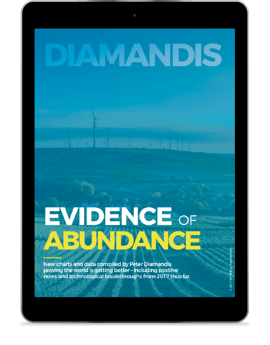 My amazing team (for whom I am very grateful) has put together an Evidence of Abundance ebook with those charts and data. Consider it “conversational capital” for your dinner table conversations or some inspirational reading for your travels. This Thanksgiving, I’m grateful for the opportunity to inspire abundance-minded leaders like you... and that I get to spend every day coaching exponential entrepreneurs tirelessly working to solve the world’s greatest challenges.